The pivotal member of Team Froesch is Melissa - whose reputation as an accomplished horsewoman precedes her in all sections of the equine industry. Melissa Froesch is a dedicated equine professional, who takes a holistic approach to each individual horse's health, breeding and training. 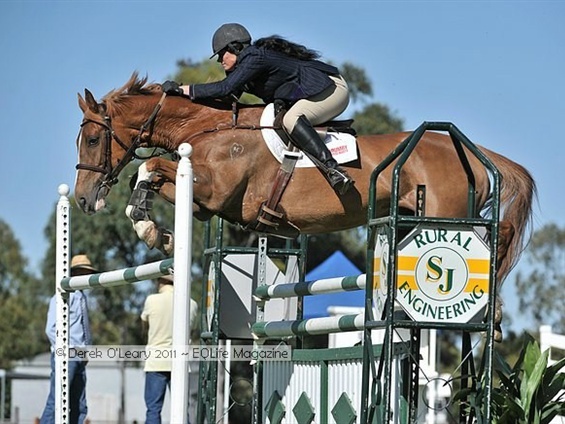 Melissa's passion for training and breeding show jumpers, comes from a lifelong dedication to pursuing equine excellence. The walls of Melissa’s office are covered with photos showcasing her numerous wins and achievements of the professional show jumping circuit. At the age of just 16 years, Melissa Froesch was the youngest rider to place (she came 3rd) in the Royal Melbourne Grand Prix Class in 1993. 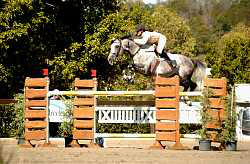 Melissa's mount -Miss Cognac - was only one if three horses to jump two clear rounds that day over a course designed by International course designer John Vallace. In 1994, Melissa Froesch won the Horseland Young Rider of the Year at the age of 17. She won the NSW Country Championship title in 1995. Melissa has enjoyed many other wins in showjumping and can boast that a record she set as a 13 yr old - winning the main steeplecase race of the day at the Findon Harriers point to point - the Findon Hunt Cup - still stands!! Meliisa has represented Australia in show-jumping at the Asia Pacific Games in 1995 at Werribee Park Won and placed. She also represented Australia in NZ, Korea and Malaysia. Melissa has won the Champion of Champions at Werribee Park three times; 2002 the very first time this event was ran she won this on her grey stallion Warlord II; in 2010 she won on Glenara Master Cognac; in 2008 she won on Glenara Bollinger. Melissa has hunted in Australia, USA and New Zealand!! Horse breeding and show jumping runs deep in Melissa’s veins. She learned from her father, master horseman Bert Froesch. Watching Melissa ride and seeing how effortlessly she controls a powerful horse like stallion Warlord II, its easy to believe horse riding is in her DNA. The equine education the family gave Melissa Froesch has molded Melissa into the exceptional horse woman, rider and trainer she is today. 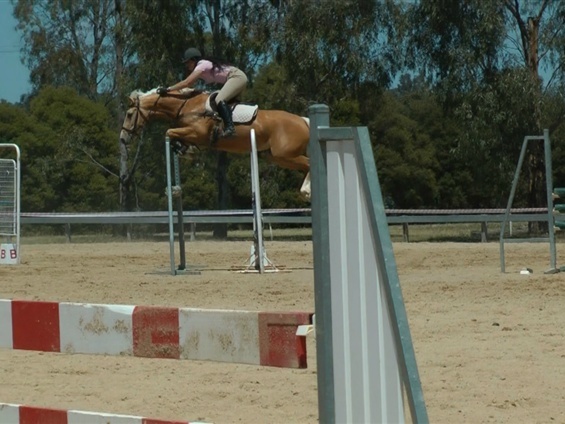 There aren't many breeders who can boast they compete on their own home bred horses', however Melissa sees this as an integral ingredient in her recipe for assessing a fit, healthy and competitive horse. Excellence in horsemanship is practiced by all members of Team Froesch, evidenced by Melissa and her husband Patrick O’Shea’s other equestrian pursuits. 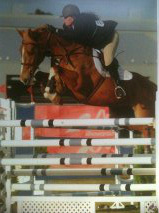 Click this link to watch Melissa on Glenara Bollinger in the 2011 Wodonga World Cup Jump Off. Melissa is married to Patrick O'Shea, who is Huntsman for the Findon Harriers Hunt Club at Woodstock in Victoria. They have a son, Connor and daughter Opal. Jumping with the Stars 'Champion of Champions' at Werribee Park is a showcase for Australia's best up and coming jumping horses. Judges include international competitors who actually ride the winner in each age group - four, five, six and seven-year-olds - before declaring one horse the Champion of Champions. 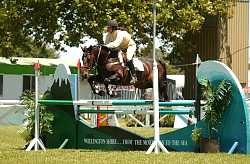 Melissa has enjoyed considerable success at this event, especially in 2002 when she became the only rider to win the prestigious title of Champion of Champions - in conjunction with her mount, stallion Warlord II. In 2008, progeny from Melissa's TOP Grand Prix mare - Miss Cognac Glenara Bollinger (Sire Warlord II) won the title of Jumping with the Stars "Champion of Champions". Glenara Bollinger continues to excel at World-Cup level for Melissa. In 2010 Glenara Bollinger's full brother Master Cognac, became the first 5 yr old ever to win the title of Jumping with the Stars "Champion of Champions". 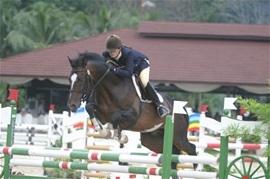 In 2002, the combination of Melissa adnd Warlord II won Jumping with the Stars 'Champion of Champion Jumper'. Meilssa Froesch is the only rider to have won every event on the winning horse and was duly recognised for her equestrian riding excellence. Here, Melissa is presented with her trophy by New Zealand Judge, John Cottle. 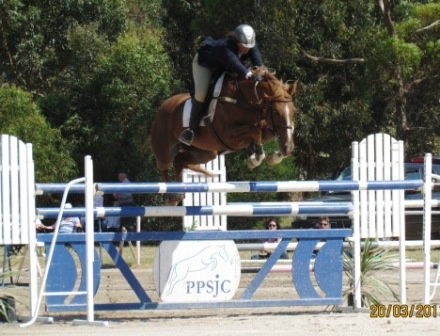 In 2008, the combination of Melissa Froesch and Glenara Bollinger won the Jumping with the Stars - Champion of Champions competition at Werribee Park. In 2010, the combination of Melissa Froesch and Master Bollinger won the Jumping with the Stars - Champion of Champions competition at Werribee Park. Master Bollinger was the first 5yr old to ever win the prestigious event. Here, Melissa is presented with her trophy by Bev Edwards, mother of event sponsor Chris Chugg.